Skype is a popular voice over IP client for various operating systems. It has since then evolved to not only offer voice over IP capabilities but also video conferencing, text chat and instant messaging functionality. The standard Skype software needs to be installed in the Windows operating system. This installation can add some weight to the computer system if the user is not checking on the advanced options during installation. Skype Portable as the name suggests is a portable version of the voice over IP client. It comes with the exact same functionality as the original Skype program but does not add any background processes or information to the Windows Registry. 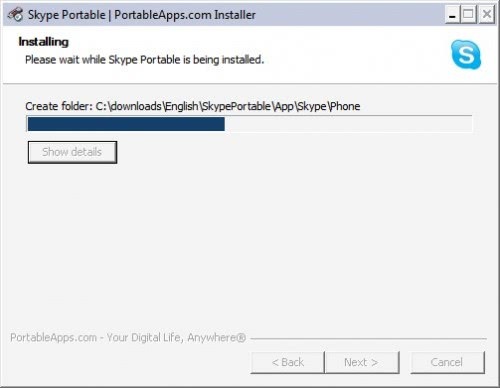 To avoid legal issues with Skype the portable version will download Skype during installation. That download has a size of about 20 Megabytes in addition to the one Megabyte download of the portable Skype application. Skype portable can then be started from the location the software was downloaded it. Information like contacts are tied to the Skype account which means that they are accessible for Skype users who log into the Skype network with the portable version of the client. Skype portable is available from the Portable Apps website. It is compatible with Windows 2000, Windows XP, Windows Vista and Windows 7.